Easy Tomato Recipes – Tomato Recipe – Tomatoes Recipes | Cook Eat Delicious! Tomatoes in salsa, tomatoes in spaghetti sauce, tomatoes in a salad, tomatoes in vindaloo. I love tomatoes. 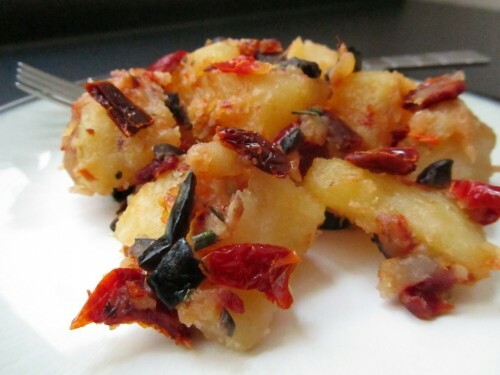 Ooh, and sun dried tomatoes are so good with crackers and goat cheese or in a couscous. Now I know what you are thinking, “Tomato is a fruit right?” I know the Tomato is a fruit. But for culinary purposes we will refer to it as a vegetable. It can cause some confusion and apologize upfront. I just don’t like calling something a fruit when I always cook it as a vegetable. Sorry, will you please forgive me? Yes? Good. Thank you. Soups are the quintessential staple in food history. They are cheap and easy to cook up. Comforting on a cold day and perfect to start a multiple course meal. My DH loves soup. Whether hot or cold, search smooth or chunky, here he always tends to give me a standing ovation for the ones I cook! I always try to cook soup on one of my busy days during the week. They are just so easy and you can always double the batch and freeze for another time. Pureed soups are rich and creamy (without the cream) so combining flavors that go together are a must. Tomato & Basil are fraternal twins, search so different but they ultimately are a perfect pair. This is also a great healthy dish. It is full of veggies and all of their great benefits, plus it is Vegan & Vegetarian! If you make this a night or two before, you can put into a thermos or microwaveable container and take to work! 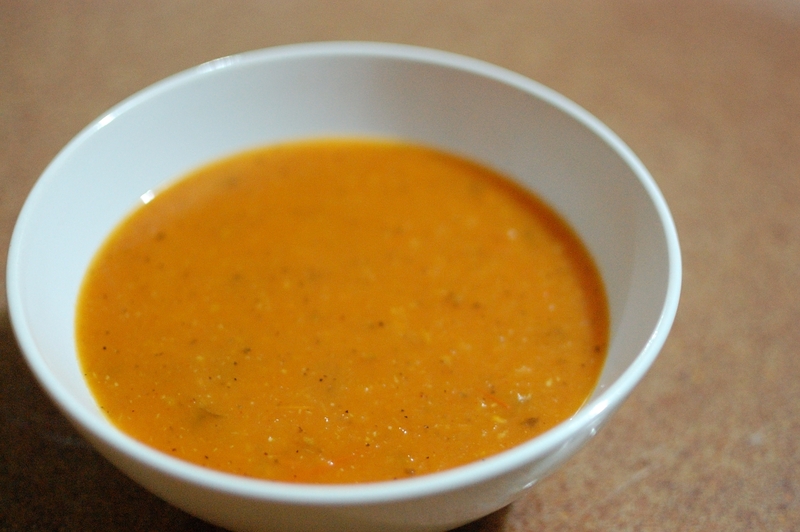 Delicious Rating: This easy recipe for soup can be made by a beginner…I hope. The steps are so easy: chop, boil, blend, boil! What could go wrong? 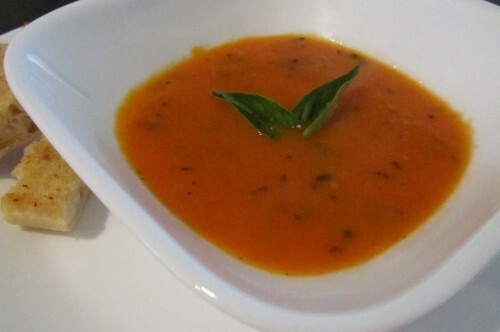 If you are a true tomato & basil lover than this soup is for you. I think I would add cream or some sort of dairy to it next time for a different flavor but that is my own personal preference. My DH enjoyed it and said it was better than all those canned soups he grew up eating! I served this Tomato Basil soup with some french bread but would also go great with a grilled cheese sandwich! Savory tarts are an all in one meal. Eggs, milk, and cheese come together in a flaky crust to create a delicious meal served warm or at room temperature. You can customize them to be perfect for breakfast, brunch, and dinner. 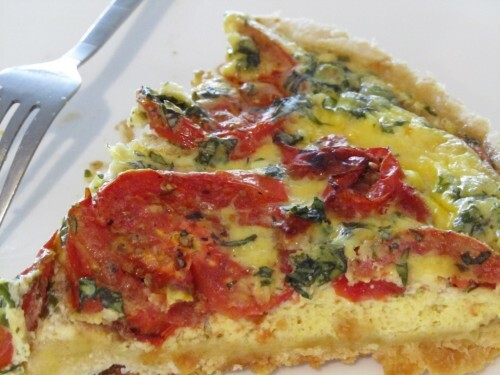 This Tart recipe combines two ingredients that were meant for each other: Tomatoes & Basil. What could possibly go wrong with this? Delicious Rating: I rated this for a master chef just because of the crust. Homemade crust takes time to perfect although it can be a simple thing for most people. The tart smells delicious while baking but the taste didn’t take a stand when served. It was just Okay, not delicious. I don’t think I will cook this particular not so easy recipe again. But if this seems like something you may enjoy please cook it and let me know what you thought! This recipe is from “The Good Housekeeping Step-by-Step Cookbook”, a gift from my Father. I have had this recipe bookmarked for awhile and decided to cook it up for “Bookmarked Recipes”, a great event hosted by Jacqueline from Tinned Tomatoes and Ruth’s Kitchen Experiments as the Challenge founder!